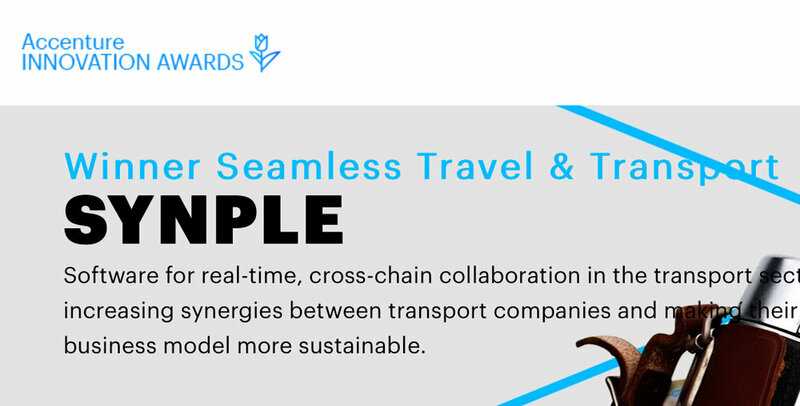 The jury in the category of ‘Seamless Travel and Transport’ declared on friday's event that “Synple puts forward a strong innovation with impact on the world, based on a straightforward but groundbreaking logistics model.” Logistics tech start-up Synple has developed a collaboration platform for road freight companies. In the finals on friday's Accenture Innovation Award event, co-founder Roderick Rodenburg won the pitch-round. In this year’s round, Accenture scouted over 770 innovations from Start-ups but also Corporate innovations. In the past 2 months, a jury of ten experts from the fields of travel, transport, logistics and innovation, have been scrutinizing over 130 innovations. Synple made it to the finals, where together with 5 other innovative startups and corporates had to present themselves to the jury and a large public in a pitch round. After a pitch from each innovation, the jury and the crowd asked many questions about the business model, the future growth perspectives, and the differences to other successful innovative initiatives. The jury represented the industry sectors of travel, transport, logistics and also had a number of experts in the field of innovation. Amongst others, the jury existed of Mattijs ten Brink (CEO Transavia and jury lead), Eric van den Dobbelsteen (director at Booking.com), Onno Benninga (Industry Director at Google), Martin Gussinklo (VP Fieldplanning and Engineering at FedEx Express), Liselotte de Maar (Global Travel lead at Accenture Strategy), Janine van der Meijs (CFO at Schiphol), Marco van Kalleveen, (COO at Leaseplan), Debby Woesthuis, (Division Director Bus at GVB Amsterdam). The jury ruled that the points for ‘impact on the world’, ‘scalable business model’, ‘social innovation’ en ‘tech innovation’ scored high for Synple. Especially the straightforward and the well applicable model for horizontal collaboration in logistics is very promising, says Mattijs ten Brink, CEO Transavia, during the Award ceremony. A voucher of 25.000€ of advisory services by Accenture is attached to the Award. “We want to use the voucher for our customers, transport companies, to further innovate the logistics sector”, says Machiel Resink, co-founder at Synple.